A.Romanowsky (San Jose State, UCO), D.Martínez-Delgado (Heidelberg), et al. Explanation: Spiral galaxy NGC 4651 is a mere 62 million light-years distant, toward the well-groomed northern constellation Coma Berenices. About the size of our Milky Way, this island universe is seen to have a faint umbrella-shaped structure that seems to extend (left) some 100 thousand light-years beyond the bright galactic disk. The giant cosmic umbrella is now known to be composed of tidal star streams - extensive trails of stars gravitationally stripped from a smaller satellite galaxy. 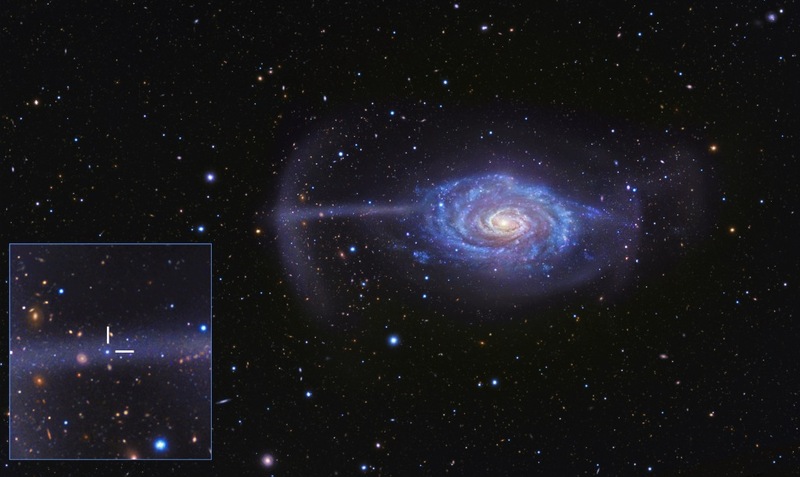 The small galaxy was eventually torn apart in repeated encounters as it swept back and forth on eccentric orbits through NGC 4651. In fact, the picture insert zooms in on the smaller galaxy's remnant core, identified in an extensive exploration of the system, using data from the large Subaru and Keck telescopes on Mauna Kea. Work begun by a remarkable collaboration of amateur and professional astronomers to image faint structures around bright galaxies suggests that even in nearby galaxies, tidal star streams are common markers of such galactic mergers. The result is explained by models of galaxy formation that also apply to our own Milky Way.